As a homeowner, you might not pay a lot of attention to your vent covers. These are necessary components as they help to direct the airflow once it leaves the ducts in your walls, ceilings or floors. There are several different types that you can install ranging from the very basic to decorative and everything in between. First and foremost, before you go around and install new vent covers throughout your home, you should understand their purpose and how changing them can affect the level of comfort in your home. Cooled air is blown through your ductwork and the vents are where this air actually comes out into your home. The shape and size of this cover has a direct impact on the way this air is dispersed, so it’s important to make sure that you choose the right application for your home. Most commonly, basic HVAC vent covers will be installed in new homes and apartments after construction or remodeling. These are typically painted to match the surrounding décor, and they serve a very basic purpose of helping air to flow through a room. However, these covers do present some issues. First of all, they don’t maintain a very tight seal with the wall, floor or ceiling. This allows some air to escape and when this happens, it isn’t being delivered to the part of the room that needs it the most. A better option than basic HVAC vent covers is the magnetic counterpart. These are typically fitted directly over the basic grate-style cover to create an airtight seal with the wall, floor or ceiling. Like the basic ones, they can be painted to match the surrounding décor. 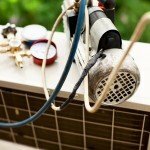 Installing them in even a large home will only cost about $100 since it is a simple do-it-yourself project, but the savings will be evident within just a few months since more cooled air is being directed into the ‘comfort zone’. Magnetic HVAC vent covers are definitely a better choice than the traditional option and even though they can be painted, they’re still quite plain in appearance most of the time. The good news is that you can purchase decorative covers from most home improvement stores, and some will even create custom covers that you design yourself. Some of the most popular options are chrome, brushed nickel and even bronze, though different colors and styles are available to fit your needs. Finally, if you have a bigger budget and you’re interested in saving even more money, you can consider programmable vents. These look a lot like the basic option, but there’s one major difference – they have built-in thermostats that will open or close the vents in order to achieve the desired room temperature. This is a relatively new technology and it works best in larger homes with several rooms that aren’t used as much as others. Overall, there are many different types of HVAC vent covers from which you can choose. Whether you want basic, decorative or even programmable, they are all available from various Florida retailers.